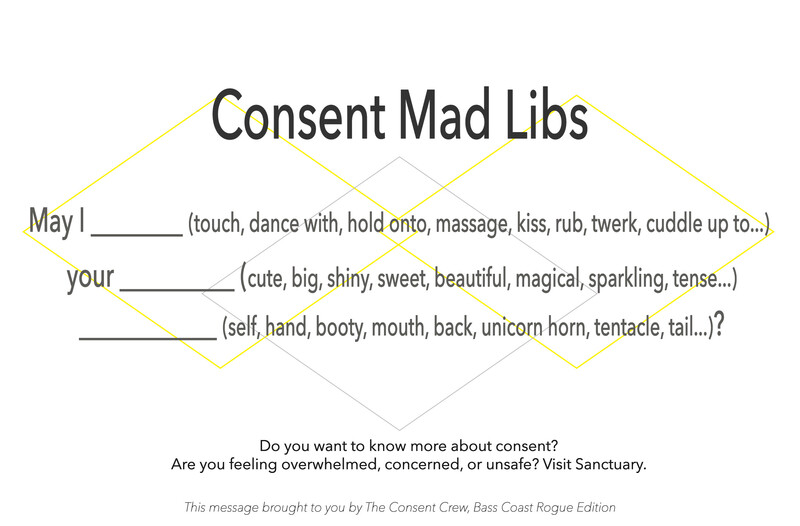 Earlier this year, the National Coalition for Sexual Freedom (NCSF) organized a Consent Summit in Seattle, a part of their “Consent Counts” program. Victor and I were fortunate enough to attend and engage with other Consent-minded educators, community members, advocates, and activists. What followed was a whirlwind summer for our team, and a neglected blog. As the leaves are starting to turn, and the hectic summer schedule is fading like my festival tan, it feels like a great time to reflect* on that season of sun and exploration. Susan Wright posed this question as part of her opening plenary, and it’s been something that I’ve taken with me throughout this summer. 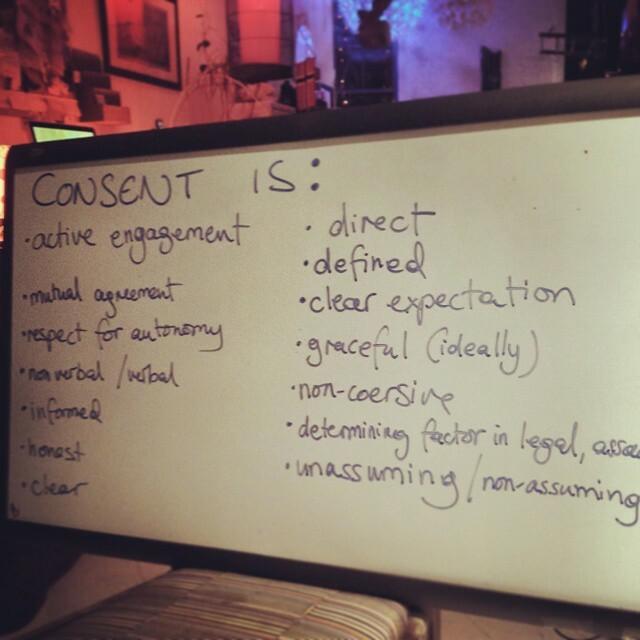 How do we most effectively educate and engage our communities in consent culture? How do we talk with our friends? Our neighbours? 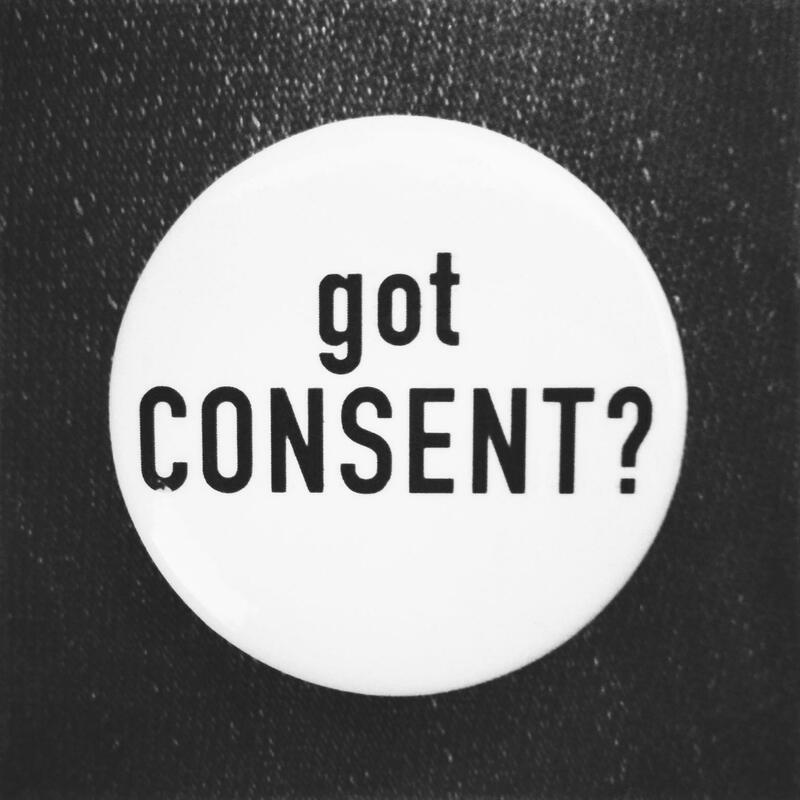 Some of my favourite education moments from this summer came from conversations that started with the simple question “what does consent mean to you?” (followed second only by conversations that started with sharing our buttons or yes/no cards). You likely know the the language, the culture, the customs, the people, of the community you exist in and have personal connections within it. You’re the best person to have those conversations. Think it won’t make a difference? I challenge you to give it a try to see the results. Some communities that I’m a member of are a very huggy bunch. Some of us in those communities have some pretty strong boundaries around who we’ll hug, or if we’ll hug at all. I’ve seen an incredible ripple effect happening just by asking before sharing a consensual hug with someone. Same with asking (and waiting for a “yes!”) before I get a little closer on the dance floor. Not in a hugging community? Think about other ways that you connect and interact and start there. I’ve always been a bathroom reader, and, it turns out, so are a lot of people I know. Creating portapotty and washroom posters for festivals and other events has turned out to be a great way to connect people with the idea of consent this summer. Saucy mad libs while you use the loo, anyone? Did you see this in a portapotty near you? Nod to the Bass Coast Harm Reduction team for this signage inspiration. Not at an event where posters are an option? We heard that our custom “What’s your Yes/No?” cards shared during Vancouver Pride Weekend festivities sparked a lot of thought! We can educate and engage people all we want, but if we don’t give people space to process and learn from their mistakes, our hard work will be for naught. Creating a conversation around consent and how to handle and respond to consent accidents fosters a space where people are more open to cultivating consent culture. Knowing the Battleaxe of Consent won’t meet your skull because you forgot to ask someone before you hugged them is a huge sigh of relief for many people new to consent culture. Owning up to mistakes and learning from them is always easier in a place where we don’t expect everyone to be perfect all the time. As we ease into the autumn, expect more reflection and more education tools around here. We’ve got to do something to keep ourselves occupied while the daylight hours are on the decline. 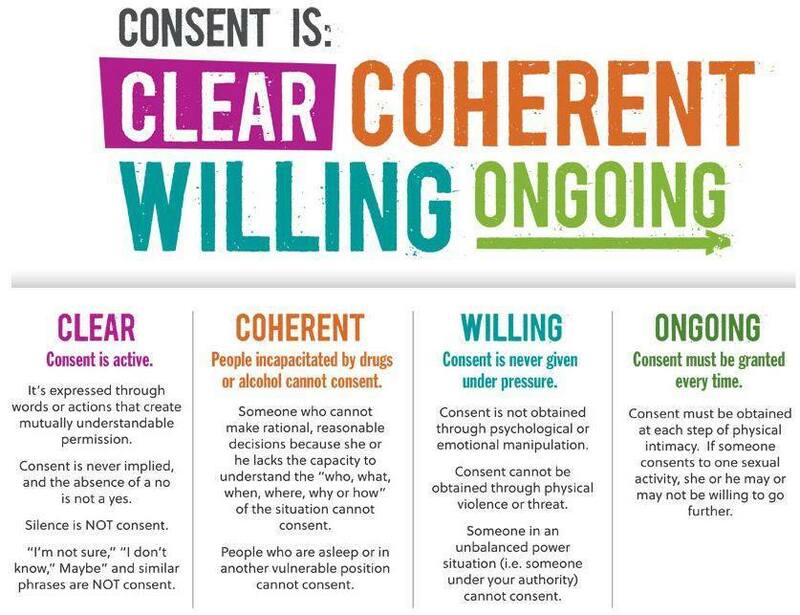 What are the ways you see consent being presented in your community that make it easy for you to understand and integrate into your daily life? *These reflections are through my (dynamic) lens as an educator who happens to be a highly educated, newly middle class, white, queer, cis woman. About the author: Kim Dee is a passionate educator with over 16 years of teaching, facilitation, and outreach training and experience. She values experiential learning and believes that any experience can become a chance for reflection and growth. She holds a PhD in evolution and behaviour and is presently pursuing a certificate in collaborative conflict resolution. A long-time social and environmental advocate, Kim is a co-founder of the Vancouver-based Consent Crew. She is an enthusiastic and committed volunteer, dedicated to creating safer, inclusive spaces in all communities in which she participates.